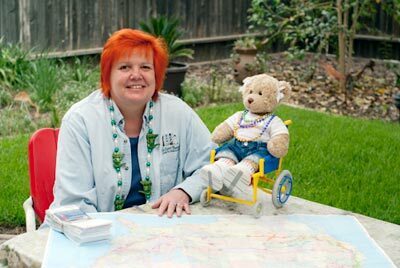 Candy & Cherrie decked out in their Mardi Gras beads and mapping out their next accessible road trip. Cherrie, Charles and I are getting set to hit the road again this week. This time our road trip will take us from California, through the Southwest, along the Gulf of Mexico and down into the Panhandle of Florida. Then it’s over to the East Cost, where we’ll head north to Charleston, South Carolina. Then we’ll spend some time in rural Tennessee, Georgia and Alabama, before heading back home through Mississippi, Texas, Oklahoma, New Mexico and Arizona. All in all we’ll be gone about five weeks, and I’ll be blogging about Cherrie’s accessible adventures along the way. About mid-way along our route we’ll also be stopping in New Orleans for the first weekend of the New Orleans Jazz and Heritage Festival. That’s why Cherrie and I are decked out in our Mardi Gras beads in the picture. I’m really excited about attending the festival, as they’ve really put a huge effort into making it accessible for wheelchair-users and slow walkers. And I’m also really looking forward to hearing Jeff Beck and Robert Plant. And of course I’ll also hit the crafts booths, and maybe even take in a cooking demonstration or two. It will be three days filled with fun, food and culture! I’m equally excited about our stop in Pensacola, where we’ll be able to see the Blue Angels perform. I’m an aircraft junkie at heart, and I just can’t pass on that opportunity. We’ll also be visiting an accessible Dude Ranch B&B in Georgia, a barrier-free mountain retreat, and a cool new accessible inn on the Gulf Coast. Of course there will be no shortage of scenic drives, and Cherrie is really looking forward to checking out the Natchez Trace. She really likes historic attractions, so Vicksburg and Montgomery are also at the top of her must-see list. These days many historic attractions are also wheelchair-accessible, so she’s able to see and experience a lot of fun things. So check back in as we make our way across the US. I’ll be posting plenty of blogs and photos along the way. And we might even have a contest or two, to keep you on your toes!! This entry was posted in Traveling Cherrie and tagged accessible travel, barrier-free travel, Blue Angels, Montgomery, Natchez Trace, New Orleans Jazz & Heritage Festival, Pensacola, raod trip, Vicksburg, wheelchair-access by Candy B. Harrington. Bookmark the permalink.